Greg Nichols for ZDNet: Paris-based startup Wandercraft, which makes a signature robotic exoskeleton that allows wheelchair users to stand and walk, just announced a €15 million B round. The founders plan to use the money to gain necessary certifications and bring what amounts to a stunning new version of an old idea to market. Wandercraft's unique offering? Its device actually replicates the biomechanical marvel of the human gait, which the company claims is a first for an exoskeleton. But technological breakthroughs aren't always business successes. Wandercraft's competitors include Ekso Bionics, ReWalk, and SuitX, among other manufacturers. 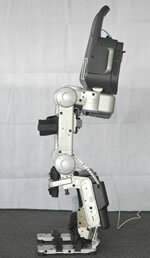 All make devices that allow mobility-impaired persons to stand and walk. To date, the primary use for such devices is in rehab centers, where there's evidence they may help alleviate secondary complications associated with sitting in a wheelchair and can assist in rehabilitation from accident or stroke.